Never throw away these 63 items. A true homesteader knows how to recycle, save these goods for reuse and save your money in the long run. Here’s our updated list of 63 things to never throw away when you’re cleaning up! Upcycling and repurposing can save you a lot of money and make good use of items you would normally throw away. You may not want the clutter but giving things new life can be both beneficial to your home and the environment. Try some homesteading craft projects with the things you may think of as junk. I am a pack rat. Being a crafter, you see craft ideas and DIY projects in almost anything and everything. Crafting for me is more on upcycling projects and repurposing ideas. Use old things and make them new again for organization or room and house decor. There are a lot of things you may think of as junk, but after a little tweaking and some love, it can turn out to be a cool homesteading project. So check out this now updated list of 63 things to never throw away. Sentimental people would understand this. You had a nice glass of wine in a celebration with family and friends. So, you keep the cork as a remembrance of that occasion. But did you know that there are so many craft projects you can make with them? Click here to get more wine cork craft ideas! Once you’ve learned how to cut glass, there are so many craft projects you can make with these bottles. Whether it be for room or home decor or useful stuff in the kitchen. Check out how to make beer bottle glasses here to get you started. Quick tip: Before you get started, make sure you have a quality glass cutter to help prevent any accidental cuts! You can make crayon art or melt them into fun shapes for new crayons. You can even make MAC lipstick colors, too! Let your kids do cool stuff by getting into pipe cleaner crafts. Here are some great ideas! If you’ve been throwing these out then your kids may be missing out on a lot. Check out some upcycling ideas here. In case you’ve been living under a rock, wood pallets are awesome for so many woodworking projects. How about trying a pallet wall art? Tires get worn out after a couple of years. Have you considered turning it into a coffee table or ottoman? In case you’ve considered throwing old books out, here are some repurposing ideas that will make you think twice. Check them out here. If they’re just laying around from your history or geography class from who knows when, it’s time to upcycle. Check out some awesome ideas how here. Used or unused, there’s a craft project waiting to happen. Get some ideas here. Add a touch of paint and you can repurpose old ladders. Need a new drying rack? Make it inspirational wall art or even a DIY headboard. If you get creative there a lot of DIY projects you can make out of an old window. Try our DIY coffee table for one. Love drinking beer? Then, I’m sure you have a couple of them around. Did you know you can make them into DIY coasters? If you think there’s no more hope for your leather belts, think again. Are you throwing the bottom of your celery away? Did you know that it’s what you need to plant to grow celery? See how here. If you’re doing your own laundry, then you must have a collection of this in the garbage already. Add this to your list of things to never throw away. One way to repurpose this is to store and dry them. It’s a great fire starter. Add vintage appeal to your craft projects with old springs from beds and chairs. Do some organizing hacks with those little tags from bread. Collect these little tabs, and you can make a DIY chain or even use it to organize your closet. So you’ve painted everything that needs painting, and there’s still some leftover. Here are some cool DIY projects you can try. Instead of throwing out old suitcases, here are some creative ways to repurpose them. Check it out here. Don’t overlook these rubber bands. They are incredibly useful around the household for keeping spatulas and mixing spoons from slipping. Do you know those paint chips they give you at hardware stores? You can do a lot of colorful craft projects with them. Here’s an easy DIY project for a DIY calendar you can create. Save your bottle caps! From table covered bottle caps to wind chimes, the possibilities are almost endless. Make cool decor and even jewelry with your old silverware. A little metal stamping can also go a long way. Aren’t these DIY plant holders pretty? Personally, I loved this one so much I had to go buy new bulbs for this project since I never kept the old ones (I do now!). Here are the bulbs I got in case you need some too! Prescription bottles should be one of the things to never throw away. Don’t just use them for your prescriptions, it’s a cute storage idea for your little items like hair clips and jewelry. This is the perfect way to store and organize your stuff. You can even try using it as a DIY dog bowl holder. So your father or husband has neckties he doesn’t want to wear anymore? What DIY project can you think of? Use this list! It’s not just old tires that you can upcycle. Don’t take that old globe for granted, you can also make it a bowl. I’m sure you’ve had your share of worn out umbrellas. The handle can be turned into a coat hanger and other cool things. So you’ve had a backyard party and have tons of used plastic spoons. Don’t throw them out. You can make awesome DIY art with them. These tins are great for storing small things. You can even turn it into a tic-tac-toe travel game too. Kids will get bored of toys pretty easily. With some paint and glue, you can turn it into a cool DIY home decor piece. With sewing, you’ll be sure to have a spare button every once in a while. Make cool button crafts out of them. Not only can you reuse them again as paper bags, but you can also repurpose them by weaving. Try to think of other upcycling ideas. 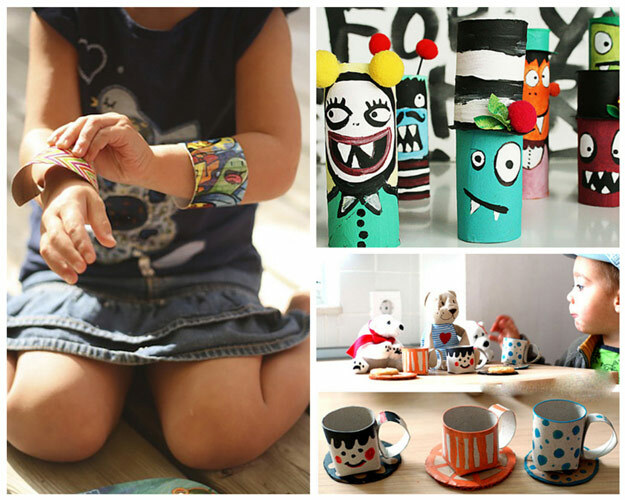 Not only can you turn them into adorable DIY clothing, you can also make so many craft projects, too. Sew old or vintage hankies together to create a curtain or quilt. There are so many other projects to try, too. When you’re no longer planning to have another child and they’ve outgrown their crib, what do you do? Add it to the list of things to never throw away. Turn it into an upcycling project of course! You can turn it into a bench or shelf! Did you know that you can make DIY jewelry with safety pins? Even if the news is old, you can still make new paper crafts with these old magazines. Clean and reuse your fancy glass bottles. They make great containers for homemade vinegar, fruit jams, herbs and spices. No need to buy salt and pepper shakers. Use your baby’s empty food bottles to make one yourself! Too many mason jars in your house? Use them as drinking glass! The next time your friends come for a visit, serve up some homemade chillers using your recycled mason jars. Use as water containers. Just be sure to date and rotate every six months. Three words: Your son’s robot. Make an improvised Emergency Heater using your empty paint cans. Here’s how. Raising your own flock of chickens? Store fresh eggs in empty egg crates if you are planning to eat them for breakfast and not hatch them. Use your stack of old newspapers to start wood fires. Use bigger tin cans as flower pots and smaller tin cans as desk organizers. Throw some soil inside old wooden boxes and grow your little herbs for yummy dishes. Put it somewhere near your kitchen to make it more convenient. Instead of throwing them in the garbage, throw them in a compost pit instead! Learn how to make a compost pit. Finished eating and throwing the bones away? Don’t! Save and freeze chicken, beef, turkey and pork bones, they’re great for making homemade meat stock. Eating homegrown eggs are delicious. But frying the eggs in bacon fat tastes even better! When the holes of your shirt have become big enough to accidentally stick your arms through, it’s probably time to consign it to your rag drawer. Cotton shirts make the best all-purpose rags! If you’re using aluminum foil to store food, save the foil sheets for future household use. Foil is an excellent pot scrubber, silver polisher and knife sharpener. Save on scouring pads by keeping old toothbrushes. They’re great for cleaning tiles, cleaning the sink and cleaning your razor. Use unwanted carrier bags instead of bin bags to line smaller garbage bins inside the house. Deter garden pests, feed your chickens, boil them in your coffee — there are several reasons why the eggshell should stay out of the trash bin. Learn more. Seasonal clothes are another one of those things to never throw away. Minimize closet clutter by storing seasonal clothes inside old cardboard boxes. Before tossing that last little sliver of soap into the bin, imagine all of them piled up over the month or year. Melt down and combine bits of leftover soaps into a usable sized bar, a lot of money can be saved up by doing making these soap bars of the things to never throw away. Learn how to make a soap bar from leftover soaps here. Want some upcycling ideas for those things to never throw away? Get 100 here from 100 Cool Ideas! Do you have these things to never throw away lying around? Let us know what you think below in the comments below! This post was originally published in January 2014 and has been updated for quality and relevancy. Ok we do most of those things, except the paint can heater. Another thing to do with soap pieces is to knit or crochet a small bag using cotton yarn. You can then put all your soap slivers in the bag and use the bag as a scrubber for yourself or around the house. When done with it, through in the laundry. You can also make fire starters using egg cartons, fill them with cedar shavings (bunny bedding) or dryer lint, melt leftover candle wax on top. Don’t forget that your chickens and pigs will all love your kitchen scraps as well. If you’re really lucky you can make friends with the produce manager at your local grocery store and get their day old stuff, your farm animals will thank you for all the fruit and veggies. 1. Fancy Jars: use to store dry goods in the kitchen, like salt, baking powder, baking soda, small grains, pastas etc. Keeps mice and bugs out of your food. 3. Canning jars: Grow a garden and CAN IN THEM! 4. Plastic jugs: Cut and use as protective covers over small garden plants when the temps dip in the early spring. Or poke a very small hole in the bottom and fill with water to place next to garden plants so you can water when you’re going to be gone for the day or will be too busy to water. 5. Shoe and cereal boxes: Add to your fire starter pile of newspapers. Or open the up and use them to covr a new garden area and then cover the cardboard with straw or grass clippings. You’ll have a clean garden space to plant up in few months without ever having to turn the soil. 7. Egg cartons: Use to start seeds for a flower or vegetable garden. When the plants are ready just tear the sections apart and plant the entire thing, never having to disturb the roots of the fragile plants. This is also a good use for toilet paper and paper towel tubes. Just fold the bottoms up so they’ll hold dirt. 10. Wooden boxes: Make good storage when screwed to a wall where cabinets would be helpful but are not available. 13. Bacon Grease: is also useful for browning other meats in, wilting lettuce or chard for a veggie side dish, making popcorn and giving a good flavor to fresh green beans and brussel sprouts. 19.I would NOT store anything in these if you live in the country or an area where there are rats or mice. Use store purchased Rubbermaid containers instead. Mice will nest and chew anything in a cardboard box making a mess you don’t want to have to clean up if you can help it. 20. Soap Pieces: can be crumbled up and placed in an automatic washing machine to help aid cleaning of overly soiled clothing and old work rags. I do this to clean all of my husbands greasy work clothes after he works on tractors and vehicles. why is the tweet/pin/facebook/etc Bar right in the middle of all of your articles?? I cant get rid of it. Its in the middle of the page…ugh! I cut my plastic bags into stripes and crochet them into bags. I use them when I shop so I get fewer plastic bags. I use my canning jars to store food in such as sugar, flour, etc. to keep bugs out . It also helps keep them dry in the humid summrts. I use the plastic bags for waste can liners, donate them to thrift shops, the local library, etc. I use my canning jars for canning goodies from my garden, or wild things, or from the farmer’s markets. Freeze some of that stuff too. I use large glass pickle type jars as canisters to store dry things like flour, beans, pasta, rice, sugar, etc. Put bay leaves around your pantry to discourage moths and such. Replace them about 2x a year. Cardboard and plain newsprint is good for your garden and compost. Shiny stuff, no. And do NOT use the shiny stuff to light fires indoors in stoves and fireplaces. It will totally clog your chimney with black junk. Cardboard boxes do attract rodents, but are great in the garden or as kids’ costumes. Leftover soap peices are good in the laundry too, and make it nice and soft. And WHERE do you get those lovely wooden boxes??? Thanks for the great tips! Wooden boxes are great finds at lots of thrift or antique stores (we have some great ones in our area)! The pic with the boxes is from LLHDesigns.com This is the link where she writes about growing an herb garden in wine boxes. http://www.llhdesignsblog.com/2011/03/details-of-our-first-ever-garden.html I’m sure Linsey would love to get credit for her picture. Thank you for all of the great ideas! With the recent discovery of plastic mayonnaise jars and peanut butter jars with lids would make great storage containers -everything from nuts-bolts-screws etc, I have stored drill bits in the small pb jars and who hasn’t stored like wise in baby food jars when they were glass-still make great see-thru storage containers.? I will be planting a garden again this year and as always start from my seed. I received keriug coffee maker for Christmas and will be using the K-cups to start the seedlings in. I remove the tops from each one then the lining inside each up and toss it the compost pile. As the seedlings get bier I just pull them out of the k-cups and replant them in yogurt cups then to the green house they go for planting. My Grandmother even washed the plastic wrap used to cover leftovers. After the leftovers were consumed, she washed it and placed over the drainer to dry so she could get at least one more use from it. I never have small bits of used soap because when the bar gets to be almost a sliver, at the very end of my bath I press it firmly onto the next new bar of soap while they are both wet (and used during the bath)…when the new bar dries and is ready for the next bath, the two should pretty firmly be one. So the sliver is always just part of the next new bar I use. I usually use the same kind of soap (Dove seems to work really well for doing this), however, I have attached little hotel soaps or even homemade soaps onto the Dove bar and I still never have slivers. I save used cooking oil, strain it and keep it in jars. I use it with floating candle wicks. Put 1/2 inch of oil on top of water in a jar or glass, float the wick and enjoy 10-20 hours of light. If the jar tips and spills, the wick usually goes out and there is less danger of fire than from a candle. I found boxes of 100 floats and 100 wicks online for about $2. Even rancid oil will work for this.